I have made this card for my sis in law as it is her birthday in a few days and I am also entering this in this months crafter's companion uk blog and this months theme is embossing. At the moment I am so loving the Makey Bakey Mice they are so cute. For this card I stamped Make a wish stamp with memento ink onto white centura pearlised card. I let the ink dry and used my beloved spectrum noir pens. 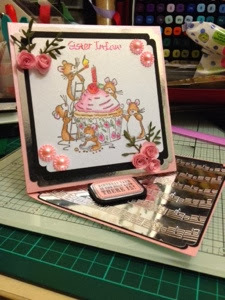 I then used a pink pearlised card from the pastels set I made a 5x5 twisted easel card. I then matted the white pearlised card onto black card and then mirri which I had attached to the pink pearlised card. The bottom layer I cut black card which I cut smaller and then the mirri card which was smaller and embossed using seasonal music embossilicious 8x8 embossing folder I do love it. Then I stamped the sentiment (birthday cake is the best kind there is) onto pink pearlised card and matted it onto silver mirri then black card. Then I put foam tape at the bottom to give it a lift. Then I added some pink pearls and some flowers. Gorgeous card and I am sure your sister-in-law will love it. Love those makey bakey mice - lovely card!! Lovely card! I bet your SIL will be thrilled with it! Chin up buttercup! Fabulous Sam. Love the mice, so many card idea, so little time.